CASE STUDY: How GrabOn started with 6 interns became India’s leading Couponic platform? Home > Blog > Blog > CASE STUDY: How GrabOn started with 6 interns became India’s leading Couponic platform? GrabOn is one of the leading couponing company in India. GrabOn gives its customers best possible price in the market using the best from technology. The company works on a cost-per-sale model and generates money through end user sale. Each time GrabOn focuses on getting with the customers using best of their technology and keeps a track on the coupons getting changed frequently according to the deal. GrabOn works directly on a strategic business model and has all the big brands on the platform. It claims to have over 2,966 online merchants including Uber, Swiggy, Flipkart, Paytm, Freecharge, Snapdeal, Jabong, Mobikwik etc. The idea of GrabOn came when the founder Ashok realized the growth of e-commerce industry and saw an opportunity to save money while shopping. So Ashok with his colleagues discussed about the idea of GrabOn and finally it was conceptualized and implemented. After too many brain-storming sessions, rejections, deletions and revisions, emerged GrabOn and was launched in September 2013 at Landmark IT Solutions. GrabOn secured $250K funding in November 2014. The team was expanded, its infrastructure was enhanced and moreover the money was invested to capture more customers through advertising. The company claims to have grown significantly in terms of numbers, visitors and revenues in the last two years. “We have around 4 million unique visitors a month on our platform. Around 5.5 million coupons are redeemed monthly and every month we have around 1.4 crore page views. We expect to record an approximate of Rs 12 crore by end of June 2016 and start making Rs 1.5 crore a month from December 2015,” says Ashok Reddy. GrabOn has best mind at their office and they have implemented their best idea to grow GrabOn. The company has emerged as the youngest company to reach 6 million visitors in a mere 2 year time span. According to the website of GrabOn, users have redeemed 69.6 million coupons through their site. 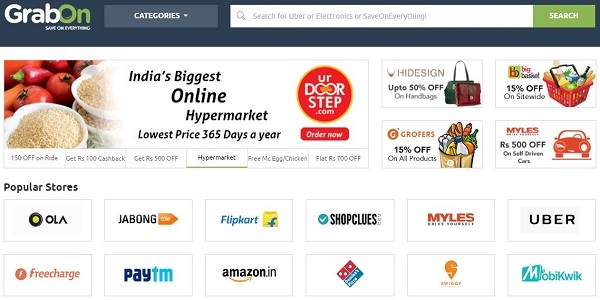 GrabOn has gained its popularity for being the fastest growing coupon company in India, with over 4 million unique visitors a month and an Alexa rank of 210. The firm is a major player in the coupon industry with GMV of $80 million per year. It has doubled its GMV to 1200 crore in the FY 2016 from Rs 500 crore in 2014-15. In terms of total numbers the company wants to have more than 50 million unique users and be one of the top 50 most visited websites in India. Started with 6 interns, the company grew to 35 employees and now plans to expand its team to 100. The raised fund last year will help the company expand into various streams such as offline, technology expansion and sales. Ashok Reddy is looking to grab another $15 million to connect a lot of missing space. The company will also use those funds to develop mobile apps for Android, Windows and iOS platforms.